Protected: Step right up and ride the Tilt-A-Whirl! OMG WTF HAVE WE DONE?! Aaron and I are in Toronto for the motorcycle show at Rogers Centre. All the big and small names were there, including local dealers. We got to sit on a bunch of bikes we’d only seen in pictures, and got a much better feel for what we like and don’t. Right now the front runner is the Kawasaki ER-6n, followed by the Ninja 650R, which is the same bike with different bodywork. The Versys turned out to be uncomfortable after a few minutes, with an unpleasant pressure point on the inside of the thigh. This was disappointing, because I really liked it at first. Second on my list was the Suzuki Gladius, but Aaron found it uncomfortable. We were both disappointed by the V-strom however. It looks great, but felt too big and kind of crampy in the leg position. I had a yellow one as the background pic on my laptop, but looks like I’ll have to replace it. Pics to follow when we get home. 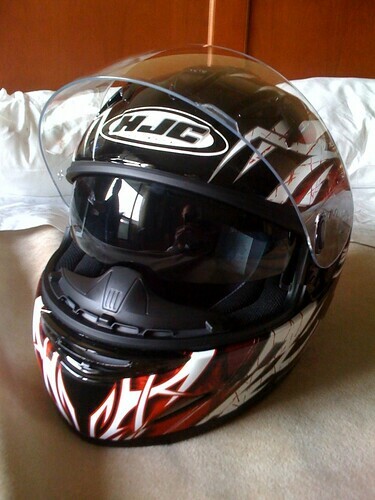 I also made my first purchase of many: An HJC IS-16 helmet, with integrated retracting sun visor. 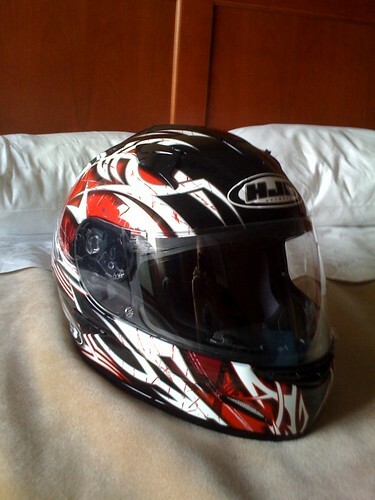 It was tagged at $225 Canadian, but the guy at the GP Bikes vendor took $200 plus tax, which worked out to $160 US. After 8 years of cynicism I’ve been infected with Hope. May it not be misplaced.